KIEV, Ukraine -- Since conflict broke out in eastern Ukraine a year ago, Russia has adamantly denied any involvement in the bloody standoff pitting Ukrainian government forces against separatist rebels. Russian soldiers pictured in Ukraine. President Vladimir Putin has dismissed as "nonsense" claims that Russia is fomenting unrest in the region by sending soldiers to back the insurgents. In Ukraine, however, a motley crew of investigative bloggers is hard at work to debunk what they denounce as a brazen Kremlin lie. "The official stance of people in Russia is: 'We're not there but we'll be victorious,'" says blogger Anton Pavlushko. "The task of Ukrainian bloggers is to prove there are Russians in Ukraine." By Russians, Pavlushko means Russian soldiers -- not volunteers or soldiers on leave, as Moscow has portrayed them, but bona fide Russian servicemen on active duty. Pavlushko, a mathematician by education, works as an IT specialist. In his free time, he trawls through Russian-language social-networking sites such as Vkontakte or Odnoklassniki, searching for evidence of Russian soldiers in Ukraine. "This takes a lot of time -- it probably takes a big chunk of one's life," he says. "Sometimes you need to study profiles for hours. Sometimes you spend months tracing a soldier and following his activities. But it's all worth it." Despite Moscow's insistence it has no troops in Ukraine, evidence of Russian involvement is mounting. And Washington think tank Atlantic Council this week issued a report citing "irrefutable evidence" that the conflict in eastern Ukraine is "a Kremlin-manufactured war -- fueled by Russian-made military equipment, fought by Russian soldiers, and supported by Putin." Pavlushko says Russian soldiers often leave a trail of photos and comments documenting their stay in eastern Ukraine, where the conflict has killed more than 6,300 people since April 2014. This carelessness has allowed digital activists to track down dozens of Russian servicemen, shed light on their activities in Ukraine, and identify their unit and military equipment, he adds. 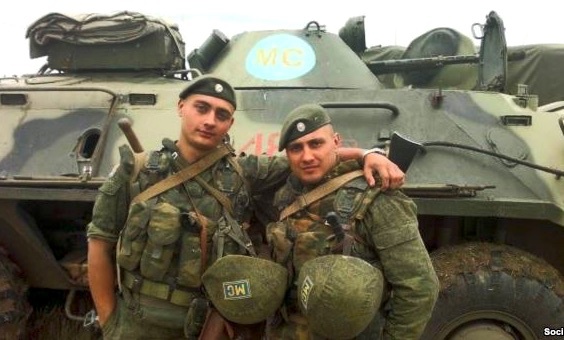 Among the purported Russian soldiers exposed by Pavlushko is Ilfat Mubarakzyanov, a member of the 23rd Guards Motor Rifle Brigade. Mubarakzyanov appears to have taken numerous snapshots while in Ukraine, including pictures in which he can be seen posing with a rifle outside a Ukrainian grocery shop, a Ukrainian electronics shop, and the entrance sign to the eastern Ukrainian city of Krasnodon. "Some of the pictures of this person show him as an enlisted soldier in the Russian army," says Pavlushko. "Then you see a series of photos from Krasnodon. He takes pictures of everything, literally of every Ukrainian signs he sees. Then you see him again in the Russian army. So this raises the question: In what capacity was this person in Ukraine?" The blogger posted his findings on Facebook and on the Ukrainian activist website www.informnapalm.org, whose contributors describe themselves as "soldiers on the information front."